February 11th marked the 3rd anniversary of the popular uprising in Yemen, which, after a long drawn-out process lasting almost a year, led to resignation of the long time dictator, Ali Abdullah Saleh. According to government’s own figures, more than 2000 unarmed protesters and military defectors, as well as more than 120 children and a total of 22,000 people were wounded over the year long protest. In a recent piece on Aljazeera, Sanna-based activist and researcher Atiaf Zaid Alwazir writes that “While many positive steps have been taken in the past three years, including the official removal of former President Ali Abdullah Saleh from power, the creation of a transitional unity government, and the completion of the National Dialogue Conference (NDC), a complete break with the past is yet to be seen.” She also co-founded the media advocacy group #SupportYemen. Our Shahram Aghamir speaks with Alwazir about the socio-political situation in Yemen. What has changed as a result of the historic uprising? Later in the program, we will mark Music Freedom Day by featuring the prominent Iranian folk band, the Shanbezadeh Ensamble, led by Saeed Shanbehzadeh. The group originates from the southern city of Busher in Iran. And the program ends with Sinan Antoon reading the poem “A Letter to Al-Mutanabbi Street,” excerpted from the book, “Al-Mutanabbi Street Starts Here”, a project of Beau Beausoleil and Sarah Bodma. On March 5, 2007, a car bomb exploded on al-Mutanabbi Street in Baghdad, killing over 30 people and injuring more than 100. Al-Mutanabbi Street is the historic center of Baghdad bookselling, with bookstores, outdoor bookstalls, cafes, and stationery shops. The street has been the heart and soul of the Baghdad’s literary and intellectual community. An exhibition of Al-Mutanabbi street is currently taking place at the San Francisco Center for the Book. More details can be found here. 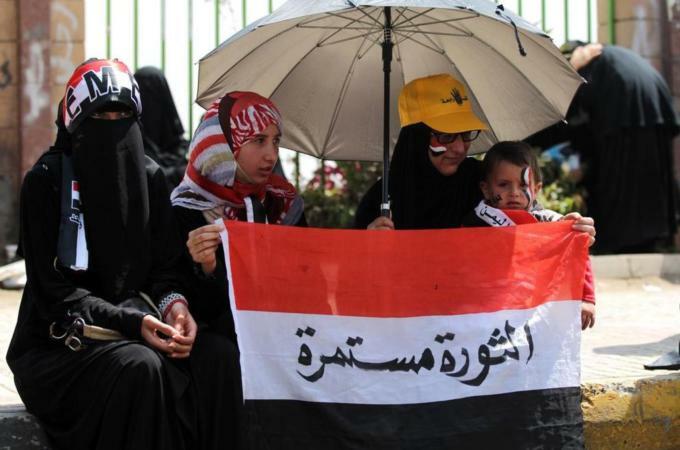 This week we speak with a University of Richmond political scientist about the uprising in Yemen. We will also speak with two Palestinian activists about the Right for an Education in Palestine campaign and their U.S. tour. This week on Voices of the Middle East and North Africa, we speak with Al-Jazeera correspondent, Hashem Ahelbarra in Yemen, about the current political crisis in that country. Later in the program, political scientist, Sheila Carapico will talk to us about roots of the confrontation between the government and Houthis. Also in the program, Yoav Shamir will talk to us about his new documentary film, Defamation. Below is a trailer of the film, and a link to our program.